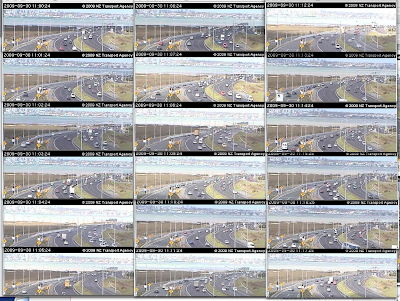 The Waitemata - from transit cameras at 10:52AM (although the time counters on the website seem to be slow by about six or seven minutes). 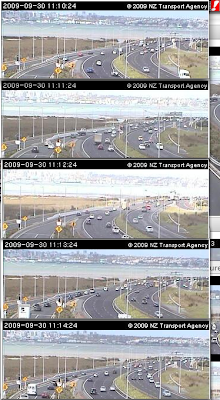 The official time the tsunami is expected to hit Auckland has been given as 11:12 NZDT. 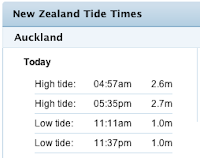 There does seem to be a difference: at 11:11 and 11:12 the tide seems to be out and at 11:10 and 11:13 and 11:14 the tide appears to be in; but I am reluctant to conclude it is definite because of the low quality images and the typical Auckland weather means the light is changing every 30 seconds and it may give a distorted impression. 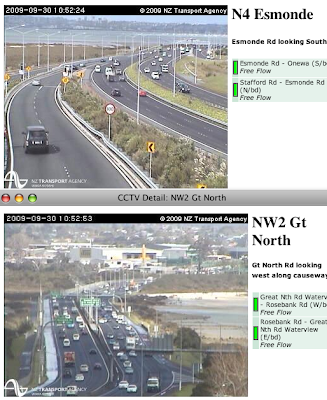 I can see the inner harbour where I am and did not notice anything odd (even using the binoculars).